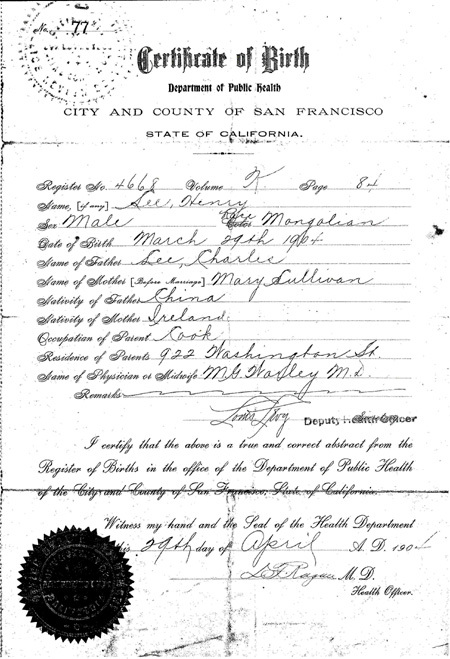 Lee Wing (Henry Lee), Certificate of Birth, San Francisco, CA; 29 April 1904, Chinese Exclusion Act case files, RG 85, National Archives-Seattle, Box 593, Case 7030/5483. Residence of parents: 922 Washington St., name of physician or midwife: M. G. Warley, M.D. Henry Lee was living in Chicago in 1933.